More than 25,000 people enjoyed hundreds of interactive exhibits featuring cutting-edge technology and world-class artistry during the second Imagine RIT festival May 2. Visitors raced solar powered cars. They played a harp with laser strings. Children made ice cream with liquid nitrogen. And some, who dared, got sucked into a black hole. 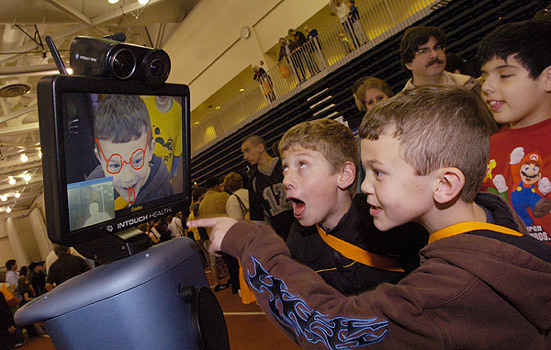 Welcome to Imagine RIT: Innovation and Creativity Festival. A crowd of more than 25,000 attended the second annual festival on the campus of Rochester Institute of Technology. Imagine RIT showcased nearly 2,000 exhibitors—students, faculty and staff. They proudly displayed examples of green technology, new ideas for products and services, creative arts and crafts and groundbreaking research. Jonathan Haehl, a 9-year-old from Penfield, N.Y., was inspired. “I want to invent a space ship,” he exclaimed to his sister Catherine, 12. The children’s mother, Nora Haehl, was also dazzled by the blend of technology and art that canvassed the RIT campus. So what will Imagine RIT think of next? Put a hold on your calendar for May 1, 2010.